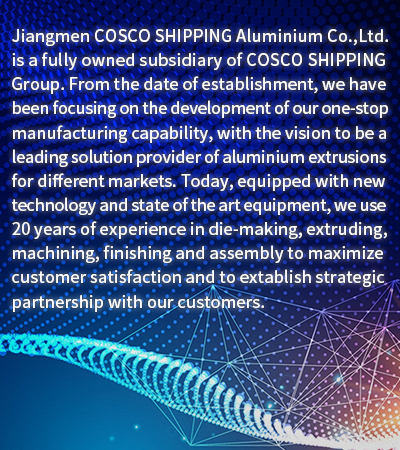 We have been a professional one-stop manufacturer of aluminum extrusions since 1998. We offer alloying, tooling, extrusion, precision CNC machining, finishing and assembling services. We have been ISO9001:2008 and IS0/TS16949:2002 certified and we are a subsidiary of COSCO GROUP. We have six extruders to manufacture profiles of different sizes. Our regular alloy includes 6063, 6061, 6N01, 6005, 6082, 6060, etc. We customize our extrusions according to your specific requirements by punching, drilling, bending, stamping, CNC milling and lathing services. We do polishing, sand blasting, clear or color anodizing, hard anodizing, powder coating, silk screening, etc. Our products include aluminum profiles, Tubes & Bars, Heat sinks, Face/End Plates (Panels), Cases & Enclosures and other industrial and constructional components which are widely used in industries of electronics, air-conditioning, TV, audio-visual equipment, coffee pots, telecommunication, safety and security, solar energy, military defense and machinery, transportation, automobiles, medical equipment, lighting, furniture, tents, skates, scooters, sewing embroidery machines, and so on. We are equipped with Spectrometers, Tension Test Machines, CMM, Salt Spray Testers and Sclerometers to test our materials and have well-trained QA/QC staff members positioned at each process to ensure quality. All products pass SGS and RoHS tests.